To read the novel in start-to-finish order, click the Volume Two link and consult the Table of Contents links at the bottom of the page. This took longer than I'd expected, but I hope you'll enjoy it now it's here. We're with Henri, on the front lines. 7th Division Headquarters: Champagne , France. February 26th, 1915 The staff officer bore the same captain’s insignia as Henri, yet the difference in status between a captain on the divisional staff and a captain commanding an infantry company was clear. Captain Vasseur looked to be little more than thirty. His hair and mustache were carefully trimmed. His gold rimmed glasses would have looked just as appropriate in a doctor’s or lawyer’s office. The uniform tunic he wore was new and of the pale Horizon Blue color which was only just being issued and had not yet made its way to the 104th Régiment d'Infanterie where the more muted colors might have actually helped the men blend into their surroundings better than the dark blue coats and red trousers of the old uniforms. Front Line near de Perthes les Hurlus: Champagne , France. February 23th, 1915 It had still been dark that Tuesday morning, just after 6:00 AM, when the company had filed into the jumping-off trench the sappers had dug over the last few days, jutting out at a right angle from the front line. The attack trench was narrow -- only three men could stand abreast in it -- and it was shallow. They had to crouch down to keep their heads safe below the level of the earth. The weather, the week before unseasonably warm, had turned cold again. Men pressed together in small groups, sharing warmth and seeking the reassurance of human touch at one and the same time. Henri’s back and shoulders ached, tensed from both fear and cold. He closed his eyes for a moment and with deep breaths tried to force the painful knots in his shoulders to unwind. At least the ground they must cross would be firm, frozen hard. “Sergeant Bertrand.” Henri spoke low rather than whispering, the deeper tones did not carry as far if there were any listeners out in the frozen no man’s land. The supply sergeant, a replacement who had arrived in January but already used to the necessities of keeping quiet in the forward trenches, moved next to him and leaned his head in to hear. The sergeant nodded and moved off again, moving like an ape, doubled over, with hands swinging close to the ground. A strange fate that modernity should have brought man back to his origins. In a few moments Henri could hear the shifting and clattering of the men taking off their heavy packs and getting out their tin mugs to accept the warming draft that Bertrand was spreading among them. The company had been on the move since two that morning, when the sections had formed up on the streets of Suippes. It had taken four hours to cover the three miles from the village to the front line, first walking beside the unpaved country roads along which horse wagons and motor trucks lumbered, carrying supplies and artillery shells forward, then through the network of trenches to the front line. Logistics officers had stood at each crossroads, guiding them through the maze of trenches crowded with other traffic, as units that had been in the front moved back for rest, and others moved forward for the attack. With so much confusion and congestion in the network of defenses, there was no chance that coffee or hot breakfast could make it from the mobile kitchens to these attack trenches, and so the day’s brandy ration was the practical solution to giving the men a little warmth and comfort before the attack began. “Not yet,” said Henri. “Offer me some when we have their trench and I’m your man.” On quiet days, the wine or brandy ration gave the men a distraction from the tedium and loneliness of military life. Before an attack, it tamped down fears and made men more willing to fight. But the clumsiness that often came with that courage was something an officer could ill afford at the start of an attack, however attractive the warmth and solace it might bring. Afterwards there would be time enough. Henri pulled out his watch when the first shells screamed over. Seven o’clock. The sky was beginning to glow with the diffuse light of approaching dawn. To the rhythmic shriek of 75mm shells passing over thirty times a minute and the thunder of those shells exploding on the German front line trench three hundred yards away was added a more steady mechanical buzz. Henri looked up, as did others, and soon they could see the white shape against the brightening blue sky. With its enchanting slowness an aeroplane was flying forward to observe the accuracy of the bombardment that was being poured upon the German positions. At seven twenty, with the light strengthening but the sun still below the horizon, the tempo of the shelling increased. No longer could they distinguish single shells passing overhead. 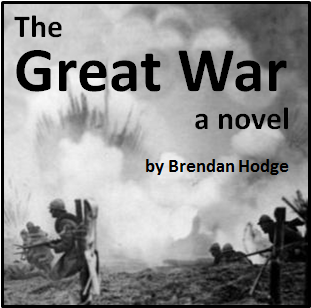 Instead there was a single flow of noise, the high pitched sound of shells above and the thunder of the bombardment hitting the German line, explosions which they could now feel through the ground as well as the abused and quivering air. Over it all, the aeroplane droned slowly, making big circles like a carrion bird above the front lines. The slow two-seater carried a heavy wireless set which allowed the observation officer to tap out messages to the artillerists, telling them where their shells were falling to most effect. Signalling to his section leaders, Henri advanced through the huddled men to one of the short scaling ladders at the end of the attack trench and climbed its few steps up to ground level. The men filed after. Up here he could see the fountains of smoke and earth erupting from the German lines, a billowing and quivering cloud, dark but for the occasional flash breaking through from within the undulating mass of destruction. The officers and NCOs formed the company up into sections, each group of sixty men filing through a gap pre-cut in the barbed wire entanglements which guarded the French line. Across the no man’s land they moved, the lines fanning out as the men picked their way across the uneven, frozen ground. Just as well, lest a German shell catch a clump of men and wipe out a whole squad at a blow. It was only as they came within a hundred yards of the German trench the the men went to ground again, waiting for the deadly rain of shells to cease before they could move any closer. They were so close to the barrage now that the concussions echoed in their chests while the sound rang in their ears. Stray fragments from a shell that fell short set two men screaming, and stretcher bearers trotted forward silently to do their lifesaving work. The enemy lines remained empty and motionless under the pounding fury of the shells. No rifles appeared on the parapet. The defenders were down in their dugouts, sheltering from the attack. Then the shells stopped. 7:30. A ringing, screaming silence which seemed in the first moment to tear at the senses with its sheer absence of noise. Henri fumbled his whistle to his mouth and blew it as he heaved himself to his feet, drew his pistol, and rushed forward. He could hear other whistles shrilling too, his lieutenants and NCOs and those of the other companies in VI Battalion to the right and left of them. As he reached the German wire he looked back. They were following, just as they should. He saw no bodies lying on the ground, and still there was no activity at the German parapet. This silence could last only seconds more. In the bunkers dug deep under the German lines, the soldiers must be grabbing weapons and rushing up the stairs to meet them. The high explosive shells had done their work on the German entanglements of barbed wire. It slowed him only a moment to pick through the gaps and shallow craters which had been blasted in the defensive barrier. A few dozen paces more and the parapet. This was the most terrifying moment of all. At any moment a rifle’s muzzle might appear, and it would be a bad marksman indeed who could fail to hit him at this distance. His reason, his very body, screamed to stop, to go to ground. But the training -- distilled by the army from its experiences of the last six months -- was clear: the soldier is most in danger as he moves towards the parapet. Do not stop. Do not slow, until you are in the enemy trench. Then you can see your enemy as well as he can see you, and your chances are greatly improved. He reached the parapet and, with a muttered prayer as his boots left the ground and his overcoat flared out around him, jumped down into the enemy trench. It was empty, save for a grey-clad body that lay on the ground a half dozen paces away, and Corporal Sellier who had half-slid down into the trench a moment before Henri jumped. Soon more men appeared to right and left. “Sixth Squad, come on!” shouted Corporal Sellier, and led his men off down the trench. Henri took a moment to lean back against the trench wall. His breath steamed in the cold morning air, but he felt hot enough to wish he could tear off his heavy wool overcoat. It would pass soon enough. Lieutenant Morel’s brandy would be welcome now too. Perhaps he’d find him. Pushing away from the wall, Henri started down the trench after Sixth Squad. 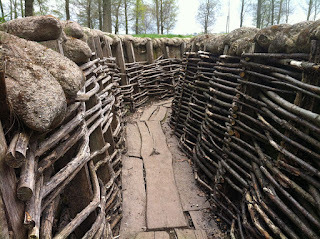 The trench walls were lined with tree branches woven together like a basket. The floor was lined with heavy wooden planks. Every twenty yards the trench turned, following a sawtooth path which made it impossible to look, or shoot, too far in a straight line. Each turn was a question: What was beyond it? Friend or foe? Henri had just passed the first turning when Lieutenant Rejol came down nearly on top of him. Both men shouted and Henri half raised his revolver before seeing who the other was. Then they attack turned into an embrace instead. “I’m glad it’s you. Are you alright? Any trouble?” Henri asked. Rejol shrugged. In civilian life, before he was called back up into the army, Maurice Rejol had become a priest. The French Republic, however, was resolutely secular. Priests remained subject to mobilization just like men their age of any other occupation. “If you won’t take the basic precaution of drawing your weapon, there will be no one but you to blame if you’re killed,” Henri said. From further down the trench they heard confused shouting and followed by shots. Both men ran toward the sound. By the time they reached Sixth Squad, Corporal Sellier and his men were herding a dozen Germans with their hands behind their heads into a bay in the trenchline where a machine gun tripod stood empty. “Any officers among them?” Henri asked, scanning the captured men for rank insignia. A captured officer could provide useful intelligence about troop strength and position. “He resisted capture and I had to shoot him,” said Corporal Sellier, jerking a thumb. Now Henri saw the body, sprawled on the rough boards of the trench floor, as if he had been shot while running away. He turned the grey-coated man over. His chest was an ugly sight. Blood soaked his tunic, the three ragged exit wounds barely distinguishable from the sticky, pulsing mess of red. He gasped for air and his eyes fluttered. “This officer is wounded,” Henri said. “Call stretcher bearers.” That at least was a more honorable task then what he must do next. Folding back the German’s overcoat he checked the man’s pockets. A little leather bound prayer book, the spidery Gothic lettering stamped on its cover looking darkly medieval. A folded letter, which even Henri’s cursory German skills could tell was from the man’s wife, no military secrets here. A photograph of a little boy in miniature soldier uniform sitting aside a wooden horse. A box of matches. A half smoked cigar wrapped in a handkerchief. Henri shoved the item’s back into the officer’s pockets, guilty at the bloody smear he left on the letter. “Did you send for that stretcher bearer?” Henri replied, ignoring the suggestion of plunder. “Call them, Corporal.” Henri let an edge creep into his voice, and this time Sellier saluted and sent a man from his squad in search of stretcher bearers. Henri continued down the front line trench, gathering up stray men, putting squads and sections under officers or NCOs, ordering them to secure the intersections with the communication trenches. He routed a half dozen men out of a bunker where they had found bottled beer and a gramophone. The tinny sound of a walz echoed up the stairs of the tunnel as Henri drove the men before him, back to the work of securing the trench. Everywhere were the signs of the half hour’s bombardment which had preceded their attack. Floorboards were smashed and wicker walls blown out where explosive shells had caved in the trench itself. Shell fragments, jagged pieces of metal up to six inches long, were embedded in the wooden planks here and there, while in other places scattered blasts of round holes showed where timed fuses on shrapnel shells had sent their inch-wide round bullets down from above like shotgun blasts. After twenty minutes, the front line was secure. The company had rounded up nearly fifty prisoners. They made them stack their rifles in a dugout and then Henri sent them back to the French line under the guard of Twelfth Squad. One of his own men had been wounded in the brief, confused fighting in the trenches, but he could walk back to the mobile hospital under his own power. The German dead they could leave where they lay until later. Now they must push on. The German line in this sector consisted of two fire trenches spaced a hundred and fifty yards apart. These two parallel lines, connected every hundred yards by perpendicular communication trenches, formed the first German defensive line. The second line of defense, which the attack timetable called for their regiment to assault at nine o’clock, after a second preparatory bombardment, was a similar pair of trenches half a mile further back, beyond a wooded rise that made it difficult for French artillery observers to target. Henri sent Lieutenant Rejol, leading Second and Third Sections, up the first communication trench. Then Henri and Lieutenant Morel gathered the remaining two sections at the intersection with the second communication trench. As the men stood close around him, Henri gave his instructions. He could not afterwards remember the words. His recollection was like a dream, of his mouth moving without any knowledge of the words, of the faces -- intent, nervous, grim -- looking at him, and then of the stick grenades awkwardly tumbling through the air. How could an attack possibly come from behind, from the fire trench they had just cleared? Fortunately, it was not the rational part of the mind which was responsible for reaction to the sight of a hand grenade. Everyone burst into instant motion. In the tight quarters of the trench someone collided with Henri and shoved him back against the wall of the trench. Shots rang out. Henri struggled to draw his own revolver, pushing away the man who had stumbled against him. Men nearer to the fire trench fought to level their rifles in the press of bodies. The grenades went off with a flash and an earsplitting report. There was shoving and struggling as some men tried to get away from the explosions while others tried to get at their attackers. Several men were on the ground, screaming, struck by fragments from the grenades. The staff officer’s tone was dispassionate, but being asked the question by this well-groomed man in his brand new uniform caused anger and frustration to clench at Henri’s throat. “No.” Of course they had not. The attack squads were supposed to move quickly. If no enemy appeared, they moved on. Letting them slow and search only led to looting and shirking. The other officer’s last sentence robbed all that came before of reassurance. Did he think that the frontline officers were incompetent fools? Let him try to lead a company and clear a sector of enemy trench. Had he even been in combat, or had he spent the last six months in staff positions telling others how to do their jobs? It was an honorably made little speech. Despite their equal rank, this man who talked with colonels and generals every day was under no obligation to treat a reserve captain from the line with consideration. He was going out of his way to polite, and if Henri had any justice -- or self interest -- he must find some way to return the courtesy. After all, had this man done anything to cause offense? Nothing, except to have the duties and influence which Henri himself might have if obligations to family had not caused him to retire from the army ten years before the war. This was the great insight? Assign a whole section to clearing duty? “That’s a quarter of my men. It will decrease my attacking strength,” objected Henri. “Your men will attack better if they aren’t slowed down by having to clear every shelter. But this is not just a duty assignment. Don’t assign one of your existing sections or rotate the duty amongst them. Pick the right NCO to command the cleaners. Pick the right men. You need killers; not your nice farm boy who follows along bravely in the attack but fires his rifle high because he doesn’t really want to kill anyone. These men will be clearing rooms. Not every Poilu is going to like that. Henri nodded. What he thought of these suggestions he wasn’t yet sure, but he must at least show outward assent. If the in the end he decided to ignore the advice… Well, this fellow would probably be promoted to some other duty soon enough, and perhaps he’d even remember which company commanders had obediently listened to his ideas. This is a copyrighted work. You are welcome to quote short portions of it in the context of an article, review or link. However, the work as a whole or in large part may not be reproduced without the permission of the author. No part of the work may be published for sale, electronic or print, without express permission by the author.